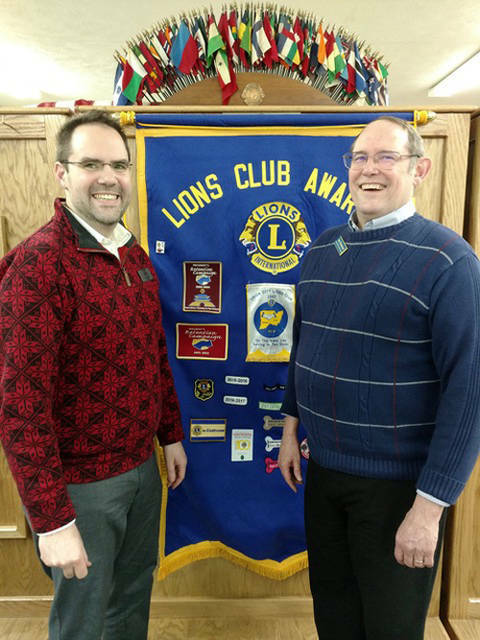 Richmond Civic Theatre President Jason Blunk and Union City Lion Sam Davenport, program chair, are pictured at the Union City Lions meeting on Tuesday. UNION CITY, Ind. – The Union City Lions Club held a regular meeting on Tuesday in the UC Community Room in downtown Union City, Indiana. Once again the meal was prepared by D’s Restaurant in Union City. The program for the evening was presented by Jason Blunk. He is the president of the Richmond Civic Theatre in Richmond, Indiana. The RCT is completing its 78th season this year. Blunk talked about the many activities at the theater throughout the year and also gave away two sets of tickets to the Richmond Civic Theatre. He said the RCT puts on about 20 productions each year, which this year included “Sister Act” and “A Charlie Brown Christmas.” Coming up in March will be a presentation of “Young Frankenstein,” in May it will be “Leading Ladies” and looking forward to next season the musical “Mamma Mia” is in the plans. The RCT also has a Radio Theatre and a Youth Theatre. It also plans shows for school groups and had about 1,000 students visit the theater over the past year. For information about RCT, including scheduled performances, ticket prices and memberships, go to http://www.gorct.org/.